Round Island received its name “on account of its form” from the French explorer Pierre d’Iberville in 1699. If the island has retained its general form over the years, it is doubtful that the name refers to the shape of the island’s perimeter. Rather, the explorer was likely referring to the island’s dome-like silhouette, created by its native stand of Slash Pine. Pierre d’Iberville was searching for the mouth of the Mississippi River when he discovered Round Island, which lies in Mississippi Sound roughly midway between the eastern end of Horn Island, a barrier island, and the entrance to the Pascagoula River. 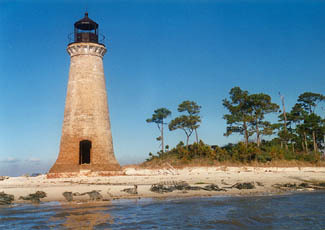 After this Gulf Coast region became part of the United States, Congress appropriated funds in 1831 for the construction of a lighthouse near Pascagoula, and the Treasury Department selected Round Island as the most appropriate site. Noah Porter submitted the lowest bid for the project and was awarded the contract for the lighthouse. Porter, however, opted to accept a more lucrative contract elsewhere, and a second contract was drawn up and awarded to Marshall Lincoln of Plymouth, Massachusetts. Contractual difficulties delayed the work on the round tower and brick dwelling nearly a year. 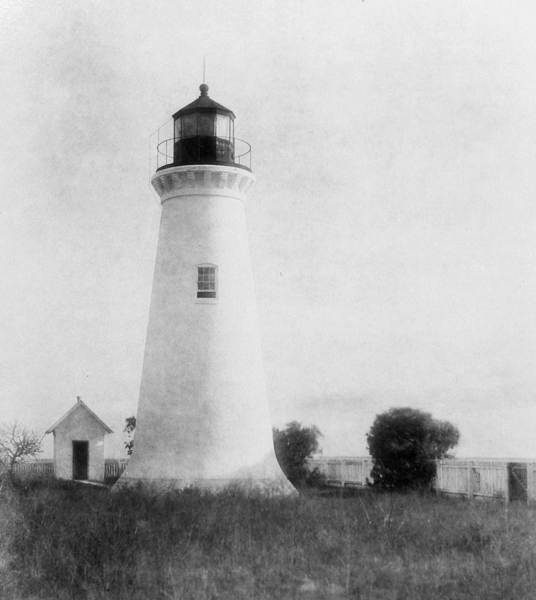 By February 1833, the lighthouse, costing $5,895, was complete, and Curtis Lewis took up residence as the first keeper, earning an annual salary of $500. Over sixteen years later, when Keeper Lemuel Childress and his two sons were returning to their residence at the lighthouse, they were intercepted by the U.S. Navy. During the summer of 1849, a few hundred men led by George White had established a camp on the island. Many of the men had fought in the recent Mexican War before joining White’s filibustering affair, which had as its goal the liberation of Cuba from Spanish rule. U.S. President James K. Polk had previously offered to purchase Cuba from Spain for 100 million dollars. When Spain declined the offer, various schemes were hatched for stirring up a revolution in Cuba. The Round Island affair was the most notorious plan, but like the other plans, it did not have the support of the federal government. In fact, three naval warships were sent to keep the group in check. The ensuing standoff exposed the deep feelings that divided the North and South and that would lead to the War Between the States just over a decade later. The South viewed the naval blockade as a violation of its citizen’s rights to assemble and as an illegal excursion into Mississippi’s waters. The North backed the President’s call for the blockade, reasoning that any meddling with a foreign power should be conducted at the federal level. The North also suspected that the liberation of Cuba was part of a Southern plan to annex the island and disrupt the current balance of slave and free states. On September 5, 1849, the naval blockade was lifted. Three weeks later, White and his men abandoned their plans and left the island, knowing that any attempt to reach Cuba would be blocked by the navy. The naval ships graciously ferried several of the mercenaries back to the mainland, and the island was turned over to Keeper Childress. The station had experienced considerable damage at the hands of the occupiers, but the light, produced by the tower’s eleven lamps backed by fourteen-inch reflectors, was soon back in service. By 1854, the sea had eroded the shore near the lighthouse and was threatening the integrity of the tower. Twenty-seven piles were driven into the sand in a continuous row to prevent the lighthouse from being undermined. 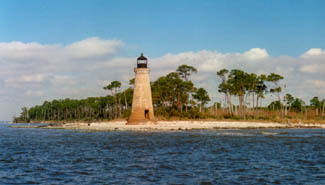 The following year, Inspector Daniel Leadbetter reported: “The existing light at Round Island, Mississippi, intended to indicate the position of the shoal which makes out southerly from the island, is exhibited from an old and badly built tower, which is, besides, exposed to destruction from the sea in any easterly storm. The keeper’s dwelling is old, not in good order, and is also being encroached upon by the sea. I would recommend that the whole establishment be rebuilt of bricks, in a position withdrawn from the present site.” Leadbetter’s recommendation was heeded, and Congress appropriated $8,000 on August 18, 1856 for a new lighthouse. 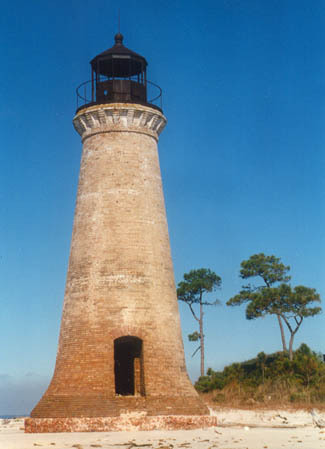 A fifty-foot, brick tower, outfitted with a fourth-order Fresnel lens, was completed in 1859. 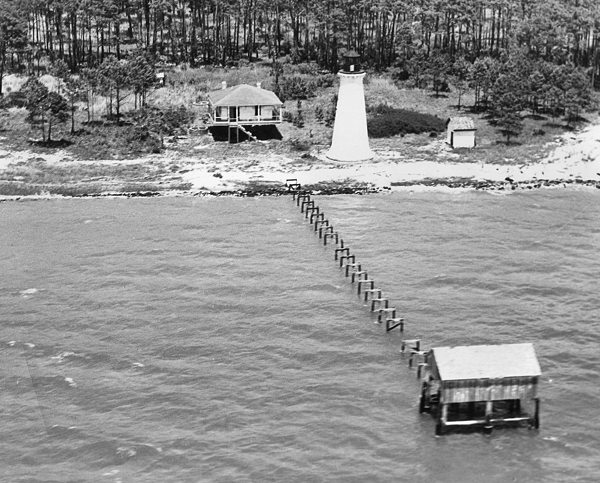 The construction of the new tower and dwelling farther removed from the water proved prudent, as a powerful hurricane struck the island in 1860. Keeper Fisher, accompanied by his wife and six children, sought refuge in the tower during the storm. From their lofty perch, the family could only watch as water swept over the island, washing away the dwelling and all of their possessions. An assistant keeper was assigned to Round Island starting in 1865, and a second dwelling was eventually built to provide more living space on the island. An oil house was added to the station in 1891. 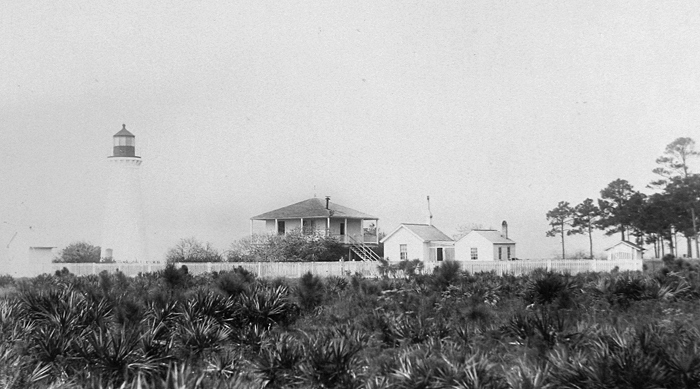 Thorwald Hansen was serving as head keeper at Round Island in 1906, when another hurricane struck the island. The following is his account of the storm as recorded in the station’s logbook for September 27. Lost the boatways, all the fence, assistant’s house washed off foundation and partly broken up and lost all but the trunk. The biggest water cistern broken and washed away. The other cistern back of assistant’s house remained but water was spoiled with saltwater. Lost workhouse and two water closets, chicken house and all the chickens. Broke up oil house, lost the oil and lots of other things in the oil house. The water was only two feet six inches from undermining the tower. Keeper Hansen spent the following day removing mud and dirt from the dwelling and noted that about eighty goats had drowned, along with seventy-four chickens and three ducks. The cattle and hogs sought refuge on an Indian mound and survived. Niels Nilsen was appointed Head Keeper of Round Island Lighthouse in 1909, and two years later George W. Fullerton was made his assistant keeper. One day in late October 1911, Assistant Keeper Fullerton noticed that his young daughter was helplessly adrift in a skiff off the island. Fullerton tried to swim several hundred yards to rescue her but drowned in the attempt. Bula Hudson, daughter of Keeper William Edward Ewing, lived on Round Island for much of the first thirteen years of her life. William and Sylvia Ewing raised ten children, and when they got old enough to attend school, the couple purchased a house in Pascagoula for use during the school year. Summers, however, were always spent on the island. Keeper Ewing had a system for catching and penning the wild sows on the island so that their litters could be sold. The possums Ewing trapped were also popular in town because their meat was much better than the city possums, which ate a lot of garbage. The tower was darkened for a period during the Civil War, but otherwise it faithfully sent out its beam of light until being decommissioned in 1944. The Coast Guard maintained the lighthouse as a daymark until 1954, and the following year the General Services Administration declared the property excess to the needs of the federal government. At this time, besides the tower, an 1891 brick oil house, a boathouse, a pier, and just one of the keeper’s dwellings remained standing on the island. The dwelling, perched atop five steel supports, had been damaged by fire since the station was de-staffed. 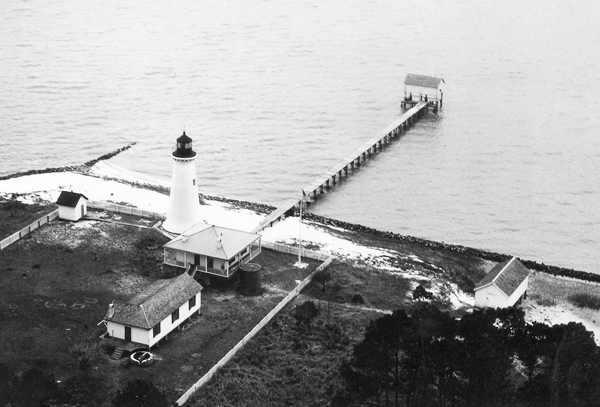 In 1986, the Bureau of Land Management deeded 48.98 acres of Round Island, including the lighthouse, to the City of Pascagoula. 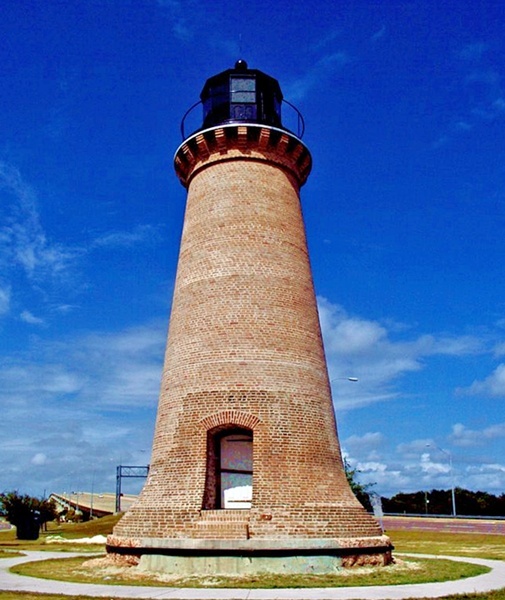 The city successfully nominated the lighthouse for inclusion on the National Register of Historic Places, and shortly thereafter the Round Island Lighthouse Preservation Society was formed. Through the years, the southeast corner of the island was gradually washed away until the tower was again perilously close to the water. The pictures to the left show the state of the lighthouse in January 1998. On September 27, 1998, Hurricane Georges swept through the area creating a ten-foot storm surge. The water undermined the foundation of the lighthouse, causing the tower to topple over. 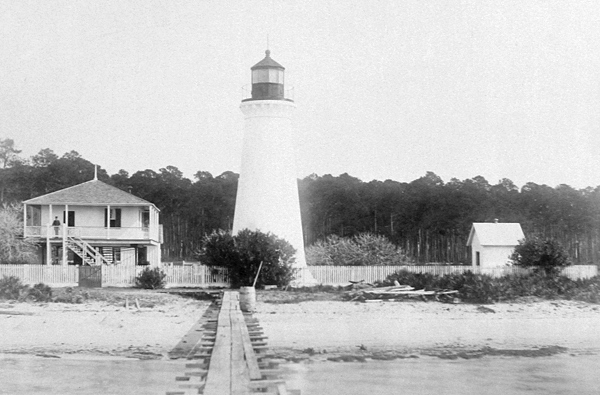 Rather than abandon the lighthouse, the preservation society decided in its first meeting following the hurricane to rebuild the tower. Backed by a $525,000 grant from federal disaster assistance funds set aside for historic preservation and restoration, work quickly began on the tower. The first phase of the project was to recover the lantern room and as many bricks as possible from the water and sand near the site. Next, Compton Engineering was contracted to return the base of the lighthouse to its original site. A fifty-foot caisson was then driven around the lighthouse stump to provide protection from future storms. Just when it looked like there was a chance of restoring the lighthouse, Hurricane Katrina dealt a devastating blow to the project in August 2005, when it toppled the lighthouse base inside its protective caisson. After Katrina, focus was understandably placed on other projects, but in April 2007 plans were officially announced to relocate the lighthouse to a waterfront site in Pascagoula. The Board of Trustees for the Mississippi Department of Archives and History unanimously voted in December 2009 to alter the scope of a $250,000 state grant it had given Pascagoula in 2003 from restoring Round Island Lighthouse to relocating the structure. With this change, the city was able to couple this money with FEMA funds to award a $615,500 contract for the relocation of the tower and site work to Jason Borries and Mike Clancy. 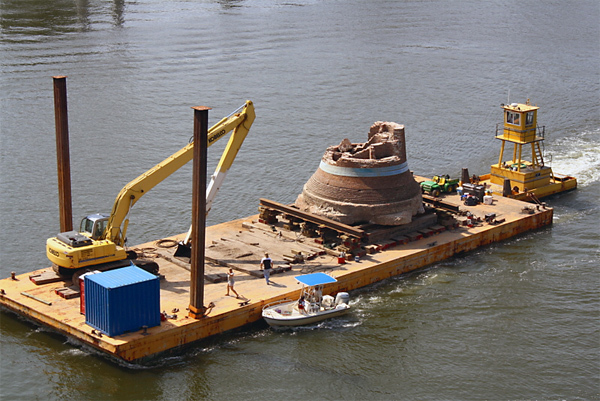 The base of the lighthouse was placed on a barge and brought ashore in late July 2010, and the caisson was retrieved from the island later that year to provide a stable foundation for the tower. By early November 2010, the caisson had been driven into the ground on the state right-of-way at the southeast side of the U.S. 90 High-rise Bridge. Five large steel beams were then driven into the ground to a depth of roughly fifty feet to reach a sand layer that is stable enough to support the lighthouse. The beams were cut off and ground level and a cement cap was poured within the top portion of the caisson to complete the foundation. In July 2011, the Pascagoula City Council awarded $40,000 to Precision Products Inc. for rebuilding the lantern room. Ken Steiner, who owns the company and did the work himself, has been told by a local historian that his great-grandfather was a lighthouse keeper at Round Island. About seventy percent of the original lantern room survives, though it is badly rusted and has some battle scars. After Hurricane Georges toppled the lighthouse into the sound in 1998, large chunks of the broken tower were retrieved and placed in storage. In August 2012, a $636,000 contract was awarded to Biloxi’s J.O. Collins Contractor Inc. to perform the final construction and restoration of the lighthouse using as much of the salvaged material as possible. The money for the work came from an array of grants, including a Community Development Block Grant, money derived from the lease of tidelands, and from the Department of Marine Resources. In May 2013, the replica lantern room was installed atop the tower, and by the end of July, the brickwork was finished. In September 2014, a $166,485 contract was awarded to Twin L Construction to restore the interior of the tower. On November 13, 2015, local officials flipped a switch during a ceremony attended by roughly 200 people to activate the restored lighthouse. 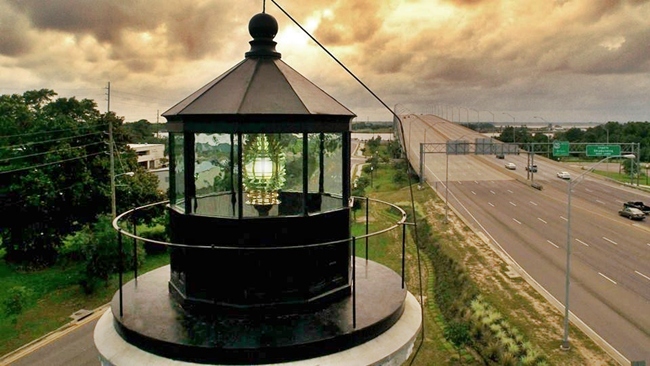 A replica fourth-order Fresnel lens, crafted and mounted in the lantern room by Artworks Florida, now beams out a fixed white light each evening to greet the thousands of motorists passing over the nearby high-rise bridge. This video shows the replica Fresnel lens atop the lighthouse after it was installed on May 15, 2015. Head: Curtis Lewis (1833 – at least 1836), Charles Quandrill (at least 1837 – at least 1839), Henry L. McRea (1841 – 1846), Patrick Espworth (1846), William Taylor (1846 – 1849), Lemuel Childress (1849 – 1853), Louis Henry Fisher (1853 – 1861), J. Duggais (1865), Edwin Bailey (1865 – 1870), Charles Anderson (1870 – 1872), Margaret Anderson (1872 – 1881), Mary A. Anderson (1881), John Murray (1881 – 1896), Robert A. Dimitry (1896 – 1904), Augusta Dimitry (1904), Thorwald Hansen (1904 – 1907), Mary Hansen (1907), Mathias W. Streckert (1907 – 1909), Niels Nilsen (1909 – at least 1916), John H. Portman (at least 1917), Frederick A. Schrieber (1917 – ), Milton E. Wheelock (at least 1919), Harry Brouwer (1920 – at least 1925), Andrew E. Steiner (at least 1926 – at least 1928), Louis Buras (1933 – 1935), Joseph J. Oliver (1936), Charles H. Carlson (1937 – 1940), William Edward Ewing (1940 – 1944). Assistant: George Miller (1865), George W. Burgess (1865 – 1866), William R. Clark (1866), John H. Sheldon (1866 – 1868), Caroline Bailey (1868 – 1871), Henry Anderson (1871 – 1872), Mathew Peterson (1872 – 1873), James Friar (1873 – 1874), Epps Danley (1902 – 1904), Ralph Gordon (1905 – 1906), Sydney Gibbon (1906 – 1909), Charles W. Heartt (1909), Thorwald Hansen (1909 – 1911), George W. Fullerton (1911), John H. Portman (1911 – at least 1915), Frederick A. Schrieber (at least 1916 – 1917), Dewitt C. Powell (at least 1921), Toney Ryan (1926 – 1927), Toney Ryan (1929), William Edward Ewing (1929 – 1940). “Next step made in moving lighthouse,” Karen Nelson, Sun Herald, November 5, 2010. “Metalworker to rebuild pieces of lighthouse,” Associated Press, July 28, 2011. “City awards final round of work to rebuild 1850s Round Island Lighthouse,” Kaija Wilkinson, gulflive.com, August 23, 2012. “Moss Point woman grew up on Round Island, when her father was lighthouse keeper,” Karen Nelson, Sun Herald, September 28, 2012. 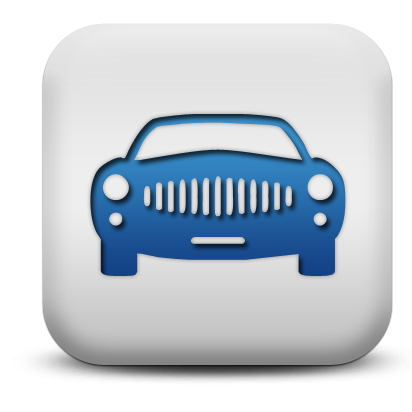 Located on the east side of the Pascagoula River, near the intersection of Highway 90 and Pascagoula Street. For a larger map of Round Island Lighthouse, click the lighthouse in the above map. Take Highway 90 to the east side of the Pascagoula River, and you will see the restored lighthouse on the south side of the road near the intersection with Pascagoula Street. The lighthouse is open for tours from 10 a.m. to 5 p.m. on Fridays and Saturdays. The lighthouse is owned by the City of Pascagoula. Grounds open, tower closed. I was accompanied to this lighthouse by my expectant cousin and her daughter. The water is quite shallow around the island, so our boat captain graciously provided waders for us to make the trek in to the tower. My cousin was quite the trooper to make the journey, and I had my first experience with a new lighthouse tool - waders.